What is probate in San Diego? Probate is a legal administrative process. Through this process, property from the estate of the deceased is transferred to the name of the inheritor. It is a court ordered transfer of property. Even if the deceased has left property, bank, or brokerage accounts to a beneficiary in a will or trust, probate in San Diego may still be necessary. This is because there are cases where the signature of the original property owner is needed to complete the transfer. There are also cases where the deceased held bank or brokerage accounts in their name alone without designating a beneficiary. Accounts will need to go through probate in San Diego to establish to whom the funds will go. 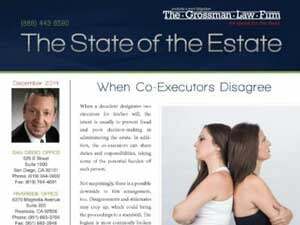 If you are the executor or administrator of an estate, then there may be additional complications, such as tax issues, legal claims against the estate, and other beneficiaries who are unhappy with the distribution of the estate and threaten legal action. It may be in your best interests to seek the guidance of a skilled San Diego probate lawyer. 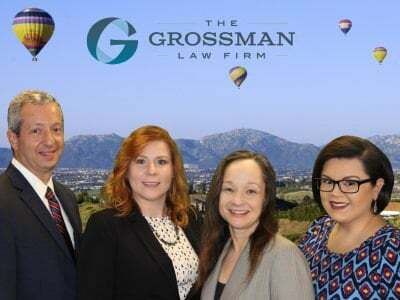 The California trust lawyers at The Grossman Law Firm offer estate planning, probate, trust administration, will contests, and trust litigation services to clients in San Diego and outlying areas. For a free consultation, call toll-free 888-443-6590, or use our quick online contact form. 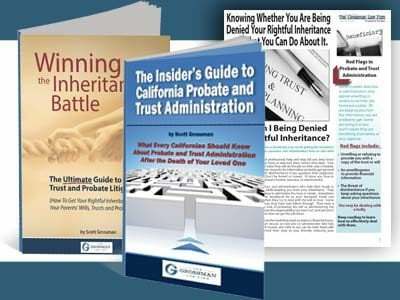 Be sure to order a copy of Scott Grossman’s FREE book The Insider’s Guide to California Probate and Trust Administration today!